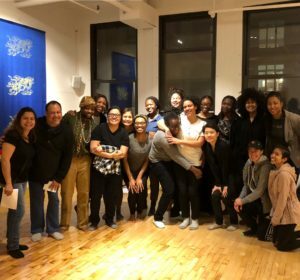 I’m so grateful for everyone who came out on Friday to create such an amazing space of healing and community. There was a lot of excitement about future offerings. We’ll be sending information directly to everyone who signed up for our list, you can also follow NYC POC Healing Circle on Instagram @nycpochealingcircle and on Facebook. Deepest thanks to the anonymous benefactor who generously offered us use of such a beautiful space. 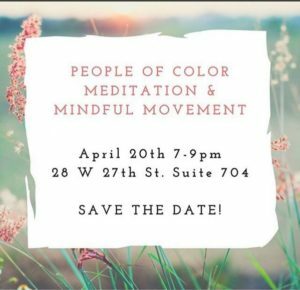 The venue for our 4/20 POC meditation & mindful movement practice has been changed. 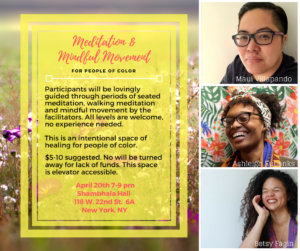 Please join us in this intentional space of healing for people of color from 7-9 pm at Shambhala Hall 118 W. 22nd Street #6A, NYC. 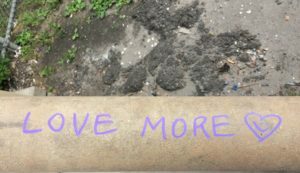 $5-10 suggested donation, no one will be turned away for lack of funds. Bring your own yoga mat. 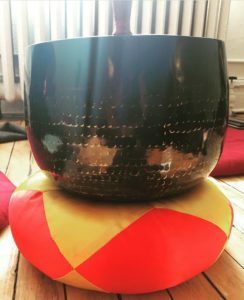 for an evening of meditation and mindful movement. 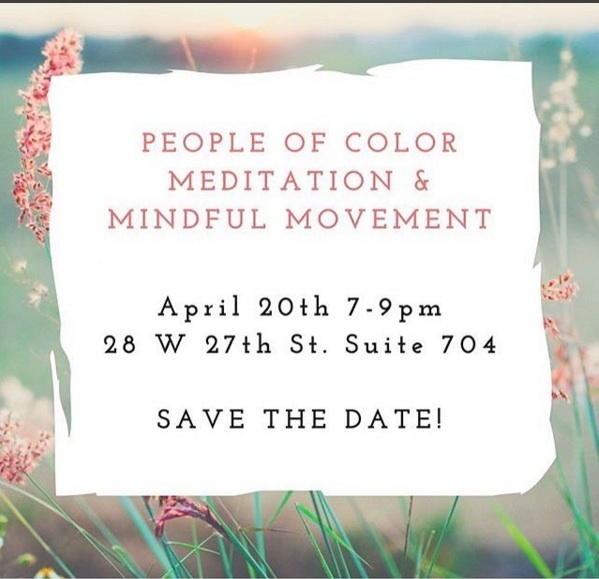 Attending directly to the experiences of People of Color (POC) who daily inhabit the intersections of multiple oppressions, this will be a POC-only space. 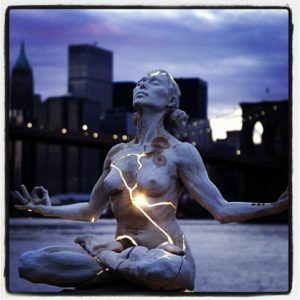 Our practice involves periods of seated meditation, walking meditation and a gentle yoga sequence with modifications. Bring your own yoga mat. The space has elevator access, but bathrooms are not wheelchair accessible. Suggested donation $5-$10. No one will be turned away for lack of funds. 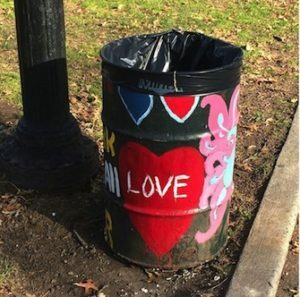 Just in time to help balance commercially-driven, hetero-normative Valentine’s day! I’m so happy to see The Open Photo Project highlighted recently by the BBC. Here’s the BBC’s brief interview with Erika Kapin about the project. 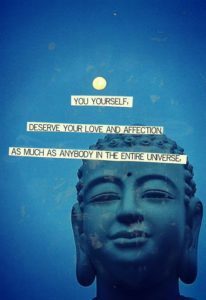 I’ll be co-leading a half-day meditation retreat Sunday February 4th, 2018 at The Interdependence Project 28 West 27th Street, NYC. From 9 am – 1 pm we’ll share a silent retreat in the heart of the city, alternating periods of sitting and walking meditation. Suitable for both new meditators and long-time practitioners. Join us! Is there a better advertisement for the cultivation of mindfulness practices than the latest Star Wars installment, The Last Jedi? Luke’s final showdown!!?! Brilliant. I haven’t found a clip to share of the part where Rey articulates the truth of interconnection / interdependence and realizes that the Force is about more than just lifting rocks, but if I find it I’ll post it here. It was lovely, and true. Here in this galaxy, if you have an interest in cultivating your own practices of meditation and mindful awareness, I’m happy to recommend The Interdependence Project’s Meditation Teacher Training program in NYC. They’re accepting applications until January 5, 2018. I’m grateful to have been part of the 2017 cohort and am happy to talk about my experiences in the program if anyone has questions. 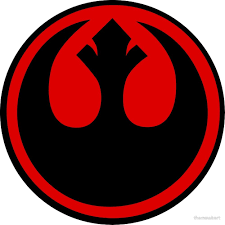 How will we build a rebellion? We have everything we need. I’m incredibly grateful for the opportunity to work with Erika Kapin, helping out with The Open Photo Project. Keep up with The Open Photo Project on Instagram, Twitter, Facebook and tumblr. Videos of interviews are posted on YouTube. Age of Aquarius focus is on the group. I guess that’s how I’m so lucky to find myself as part of this amazing collaboration happening with artist Kara Rooney, composer Fatrin Krajka, movers Dylan Crossman and Claude ‘CJ’ Johnson, and poets Marine Cornuet and Laura Henriksen. 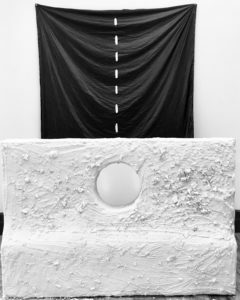 The first performance will be next month at TOTAH gallery in New York City. 636 6th Ave, 3rd Floor, NYC. Class is free, mats are free, start your weekend right! We’re going to find balance and stability within ourselves and honor the Dark Goddess in her many forms.